One of the biggest crypto exchange, which offers margins of 100x and a number of derivatives, has seemingly admitted to price manipulation and trading against its own customers with the activity carried out in broad daylight since April, yet apparently no one even noticed. The trading entity is a for-profit operation. However, their earnings are comprised of a service fee paid by the business, that is the BitMEX trading platform…. Nick Andrianov currently describes his position as Business Development Manager at Bitmex, suggesting this is just a department within Bitmex rather than a subsidiary. A market maker is someone who is willing to place a bid and ask (buy and sell) order at any price. The market maker, which is better known as a high frequency trader, usually makes money from the difference in the spread between the buy and sell order. In this case, however, Bitmex is saying they are not meant to make any money from the spread. Even though they are a for-profit entity, if they make profits then they are meant to reduce their spreads between buy and sell orders. Why Bitmex is paying what looks like a department of their own “a service fee” is not clear, but some suggest that is a rebate of trading fees, which means this trading entity can trade on Bitmex for free, unlike all the other Bitmex customers. The above is what Bitmex themselves admit. What else goes on in this unregulated exchange is unclear, but its CEO, Arthur Hayes (pictured on the left), publicly behaves in a highly unprofessional manners and makes clear his disdain for “altcoins,” especially ethereum, the smart contracts platform. In a recent “newsletter” sent to all Bitmex customers, he called ethereum a “double digit s***coin.” He further appeared to incite his customers to short eth. Has he also directed his trading desk to short ethereum? 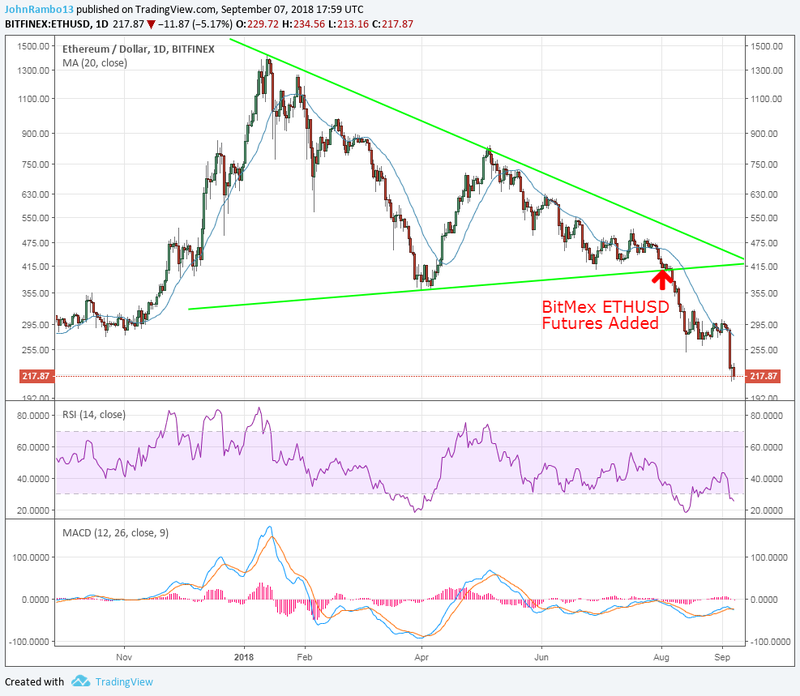 Is Bitmex manipulating ethereum’s price? Sep 2018. Bitmex, moreover, is the only entity that can short certain options contracts, potentially bringing down price pressure. There are further unsubstantiated allegations they stop hunt traders, which Bitmex denies. But they seem to be admitting they fake volumes and create an artificial appearance of liquidity, with spreads on Bitmex usually a lot higher than other exchanges. Just as they have seemingly admitted they trade against their own customers, although they do say their trading desk has no access to any information that other traders don’t, yet they do appear to have access to the trading engine when others don’t. The unregulated entity is based offshore with some recently claiming they complained to the US Securities and Exchanges Commission (SEC). As ethereum is classified as a commodity, however, it is probably the Commodities and Trading Futures Commission (CFTC) that may have jurisdiction. CFTC fined Bitfinex in 2016 for offering unregulated margins, even though Bitfinex is based offshore, and they have opened investigations on price manipulation of eth and bitcoin, but whether that includes Bitmex is unclear.